Looking for a New Tesla Model X in your area? 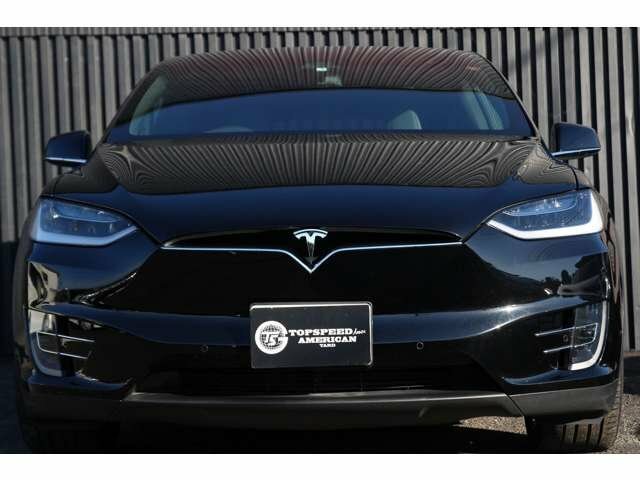 CarGurus has 3 nationwide Tesla Model X dealers with 4 new car listings. Strictly speaking, the Tesla Model X wasn’t the first all-electric SUV when it arrived for the 2015 model year; that distinction belongs to the 1997 Toyota RAV4 EV. However, the Model X is the first electric SUV with gasoline-rivaling range. For 2018, there are no major updates to report. The Model X’s exterior certainly looks like product borne out of California’s Silicon Valley. The sleek, aerodynamic shape, flush fittings, wide expanses of glass, and judicious chrome appointments all set it apart. There’s plenty of science to that profile too; Tesla claims a coefficient of drag of 0.25, which is pretty low in the automotive industry and virtually unparalleled among SUVs. The most interesting talking point is the set of “Falcon Wing” doors. These doors hinge upward on a backbone in the middle of the roof, allowing the Model X to fit into rather cramped spaces where ordinary doors need too much space to open. The interior matches the exterior. The first thing you’ll notice is the giant vertical 17-inch LCD touchscreen that makes up the entirety of the center stack. Meanwhile, the windshield is a giant piece of glass that curves all the way up and over the front seats, offering a truly panoramic view outward. Beyond that, all of the Model X’s panels and features display a profound sense of high-tech minimalism. Tesla allows you to spec the Model X with a number of different seating arrangements. By default, there’s room for 5, with two captain’s chairs up front and a bench row for 3 in the middle. However, there’s also the option of a set of captain’s chairs (with or without a center console between them) in the middle row and a foldable third row with two more seats, for 6 total. Go for the bench seat in the middle row and the optional third row, and you’ll max out at 7 seats. Configurations that include the third row benefit from standard rear heating and air conditioning. There’s storage in both the front and back, thanks to the lack of a space-robbing gasoline engine. The Model X presents three powertrain options, which more or less define the trim structure. All three are all-wheel drive by default, making use of a motor on each axle and a giant battery pack between them. The base 75D employs a 75-kilowatt-hour battery, achieving a 237 mile range, a 130 mile-per-hour top speed, and a run to 60 mph of 4.9 seconds. The 100D is the range champion, with a 100 kWh battery and the ability to do 295 miles. It’s also a bit faster than the 75D, needing 4.7 s to hit 60 and boasting a top speed of 155 mph. For those looking for the ultimate in performance, there’s the P100D. Using high-performance motors and the same battery, range suffers just a bit at 289 miles. But, the P100D comes standard with Tesla’s Ludicrous Mode, a form of launch control that enables it to hit 60 mph in only 2.9 seconds. The Model X takes as few as 6.5 hours to charge on a home connection, but all versions come standard with 400 kWh of free charging on the company’s super-fast Supercharger public network. Owing to its high-tech nature, the Model X comes with plenty of goodies. Among these is an intelligent air suspension system, 20-inch wheels, automatic-opening front doors, a power liftgate, keyless access and entry, ambient interior lighting, a towing package, heated seats for all passengers, a heated steering wheel, LED exterior lighting, satellite radio connectivity, a navigation system with Internet-enabled maps, and the ability to make over-the-air software updates. Options are fairly sparse, limited to things like cooled seats, larger wheels, and carbon fiber trim. The Model X also gets plenty of standard and optional safety equipment. Standard is a reversing camera, collision avoidance, automatic emergency braking, front and rear parking sensors, and a HEPA air filtration system that can completely seal itself off in the event of airborne biohazards. From there, you can select the Enhanced Autopilot software, which utilizes cameras, sensors, radars and GPS data to allow the car to automatically keep up with traffic, change lanes, exit the highway, merge between freeways, park itself, and summon itself. On top of that, Tesla allows you to prepay for the Full Self-Driving Capability. Though it’s not yet out and is contingent on future regulations and software testing, this mode enables the Model X to operate on the road with no human intervention in certain situations and short trips. Best of all, every Model X comes from the factory with all necessary hardware for these autonomous driving modes, so you can pay and upgrade at a later time, though it costs less from the factory. There’s no other way to put it: The Tesla Model X is a unique proposition. Instantly identifiable by its distinct shape, it’s brimming to the roof with technology and capability that relegate many other luxury SUVs to the stone age. For 2018, it continues to stand on its own in the realm of viable electric SUVs, though competitors from Volkswagen, Audi, Jaguar, and others are on the horizon. This is also the last model year in which any Tesla vehicle will qualify for the full $7,500 tax credit, so now is the time to get one if you’re on the fence. What's your take on the 2018 Tesla Model X? Have you driven a 2018 Tesla Model X? Enter your zip to see incentives for a new Model X in your area. CarGurus has 212 nationwide Model X listings starting at $60,000.